XFO Outdoor War 13 took place at Sideouts in Island Lake Saturday, and it was an electric event from start to finish. Four title bouts headlined the card, and some newcomers made their names known with huge debuts. MTC fighter Justin Lovrich entered the cage to an enormous roar from his many fans and supporters in the crowd, and he gave them something to cheer about in all three rounds of his lightweight title fight against Iowa’s Blake Butler. 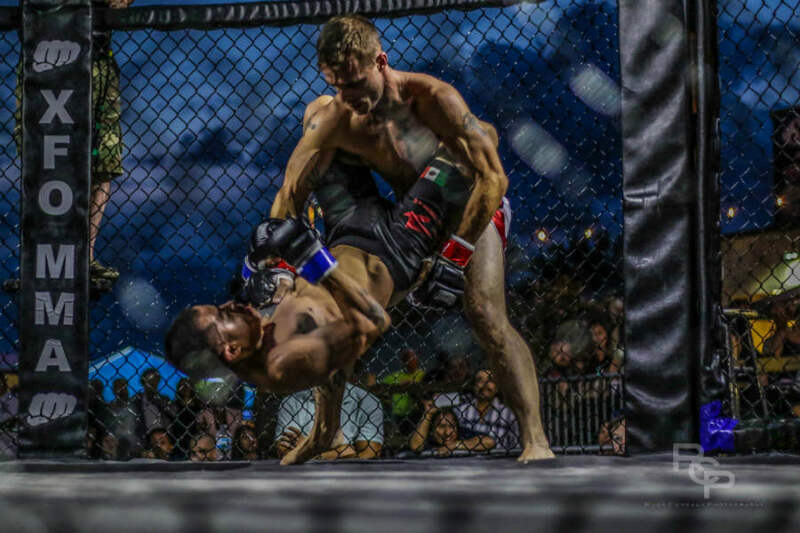 Lovrich outwrestled Butler early and often in the XFO Outdoor War main event, and all three judges saw it the same with 30-27 scores in a convincing win. MMA Stop’s Datrelle Kozeluh made quick work of Kurtis Ellis with a wicked armbar that ended the fight at just 1:10 of the first round. The win ran Kozeluh’s record to 4-0 with all four wins coming in the first round. He is definitely a top prospect on the Midwest scene. MMA Stop went 2-0 for the night. Antoine Gray has found a new home at Herc Hayes’ Second City MMA, and he left with some new hardware last night. The Michigan native had his way with Rich Moad, putting him on the ground early in their welterweight title fight. He pinned Moad’s left arm against the cage and then fired off a series of unanswered, undefended strikes that made the referee step in to wave it off at just :42 of round one. Jose Leon said he would get a finish in his XFO flyweight title defense against Northern Illinois Combat Club’s Jamie Howard, and that’s exactly what he did. Howard made it tough on him early in round one with solid ground work, but Leon was able to turn the tables late in the round and sunk in a deep rear naked choke that left Howard no choice but to tap. Chris “El Dirty” Sanchez got MMA Stop off to a killer start by dominating Soo Do Thai’s Kevin Holliday in all three rounds. Sanchez put on a clinic for top game control, suffocating Holliday with a heavy mount and whaling away with strikes. Sanchez and Holliday even exchanged some serious trash talk at the end of round three. Sanchez earned scores of 30-25 on two of the scorecards, and one judge scored it 30-24. J.R. Roberts came into enemy territory and needed just thirty seconds to put away tough-as-nails MTC fighter Jay Blancas. Roberts wasn’t surprised by his quick finish. “You’re locked in the cage with me — not the other way around,” Roberts told ring announcer Ray Flores in his post-fight interview. He remains undefeated with a record of 2-0. Gustavo Cardenas and Team Torres fighter Sam Gustafson entertained the crowd for three action-packed rounds, and the judges awarded Cardenas the decision with a 29-28 score across all scorecards. Gustafson scored numerous takedowns and seemingly got the better of the striking game, while Cardenas displayed exceptional defense from guard and off his back. This one could have gone either way, but Cardenas leaves the victor. 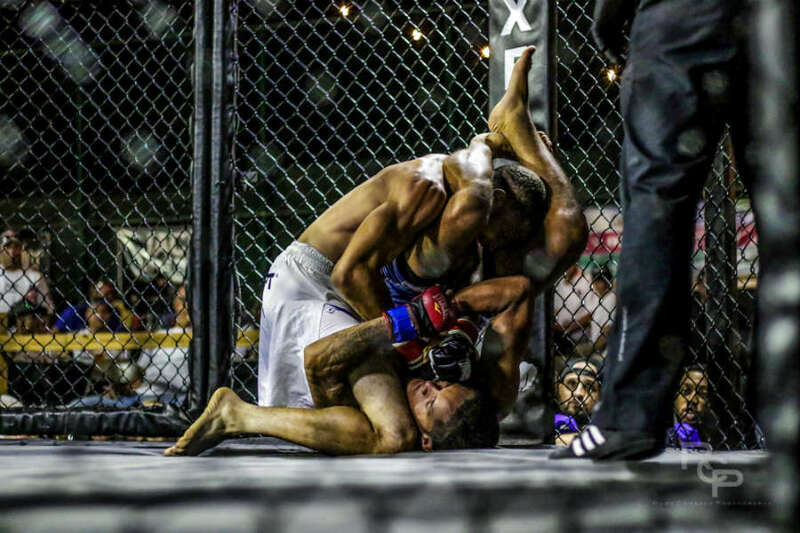 MMA Underground’s Nathan Aleo and MTC’s Abel Hernandez put on a “Fight of the Night” performance, a three-round war that had the crowd up out of their seats and in a frenzy. This fight had an inordinate amount of twists and turns, with momentum shifting multiple times in all three rounds with knockdowns, positional reversals, and blood leaking all over both fighters and the canvas. This fight went to a decision, but there was never a boring moment. The judges awarded Aleo the unanimous decision win. Soo Do Thai’s Tristan “The Great One” Canada took a little time to find his range in round one of his fight against Team Chapman’s Cecil Henderson. After he found it he let his hands go in a big way, firing off multiple combinations that wobbled and dropped Henderson, garnering him a TKO win just midway through the first round. Canada displayed championship-level skills on the mic in his post-fight interview. “Thanks to the XFO and I look forward to beating all your heavyweights.” Asked by Ray Flores about his performance, Canada said he’s got faster hands and footwork than every heavyweight. “End of story,” Canada said. 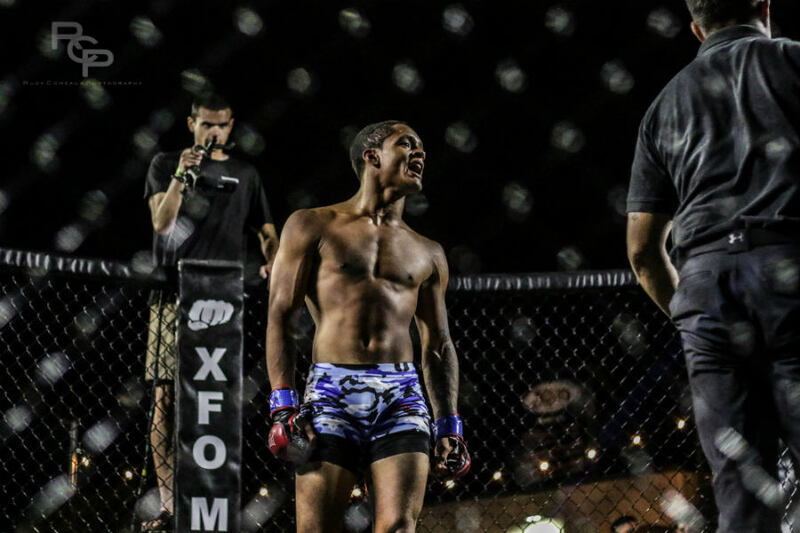 MTC’s Antoine Bess and Team Torres fighter Mitch Greenwald both made their MMA debuts at XFO Outdoor War 13 and they put on an entertaining fight. Bess was able to secure takedowns, but Greenwald showed outstanding scrambling ability. The fight ended in round two after Bess landed another takedown, this time sinking in a rear naked choke that Greenwald fought off valiantly, but eventually succumbed to. Soo Do Thai’s Kain Capps showed a diverse and dynamic striking repertoire that rocked Houston Dozier and finished him just :24 seconds into the first round. The Michigan fighter looks incredibly young, but he proved he’s no one to play with inside the cage. His MMA debut could not have gone any better. 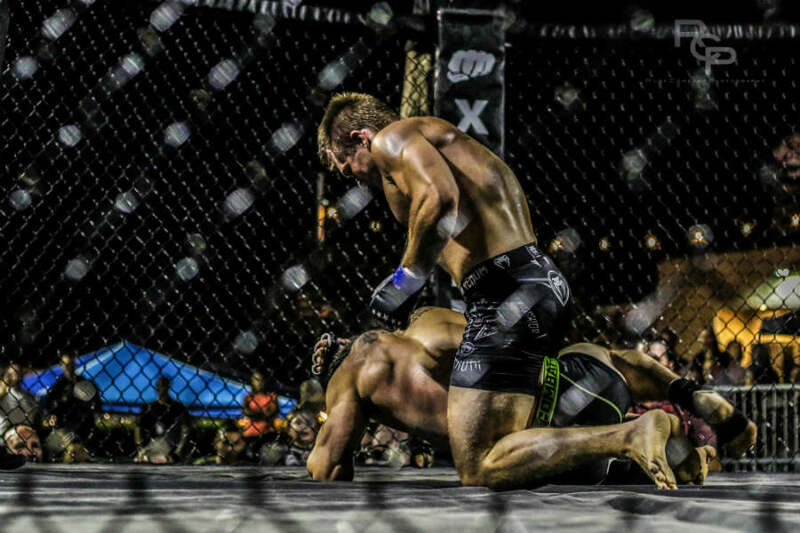 Joey Reis represents Bloomington Team 1 BJJ, but it was his right hand that quickly scored him a win in his MMA debut. Reis landed it flush on the face of MTC’s John Denikas, who crumpled to the ground from the strike. Denikas suffered a flash knockout and was quickly back to his senses, but the referee stepped in to wave it off, much to the dismay of his corner, who loudly protested the call. The wait was worth it for both the fans and Human Blender fighter Dom Ciancio. The welterweight was supposed to make his debut last year at XFO Outdoor War 12, but that fight got scratched. 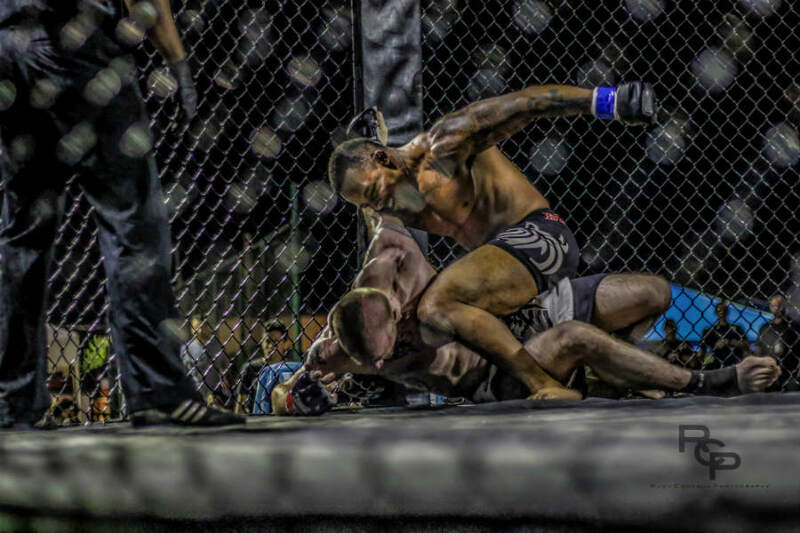 This year he had a game opponent in Red Schafer MMA’s Rodney Yapi, but his speed and precision striking added up and eventually earned him the TKO win at :28 into round three. Emanuel Pugh is having himself a killer year. The Team Colon fighter ran his record to 3-0 with a decisive win over Mikey Phillips, battering the veteran fighter until the referee shot in to end the bout at 1:58 of round one. Pugh has won all three of his fights in 2017 and earned the first finish of his career against Phillips. He’s steadily proven himself as one of the area’s top prospects — all at the age of just 19. XFO Outdoor War 13 got off to a bang with a kickboxing match between Striking Arts fighter Kyle Hurley and Combatzone’s William “The Wolverine” Jackson. Both fighters came out firing kicks early in the bout, and even knocked each other down at the same time during one sequence. But it was Hurley who prevailed after landing a vicious head kick that put Jackson to sleep at 1:37 of round one. All photos courtesy of Rudy Comeaux Photography. Follow Rudy on Facebook and on Instagram, and contact him to order prints.